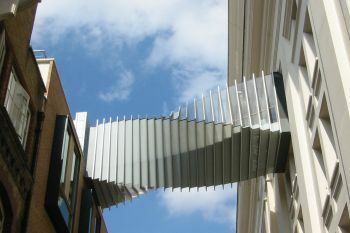 As part of City's Clerkenwell Design Week Fringe Event, engineer and bridge designer, Ian Firth, gave a well-received lecture on 'The Elegance of Bridges'. 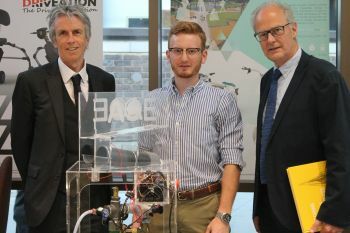 The School of Mathematics, Computer Science & Engineering also showcased an exhibition of examples of design excellence. It was an evening of all-round engineering design elegance and excellence as City hosted its 2018 Clerkenwell Design Week Fringe Event on 23rd May. Ian Firth, a leading UK structural engineer and bridge designer, and a consultant with international engineering firm, COWI, delivered the well-received lecture, 'The Elegance of Bridges', to an attentive audience. 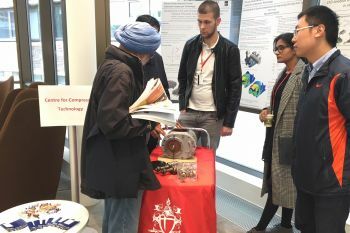 Engineering students from the School of Mathematics, Computer Science & Engineering (MCSE) also showcased an exhibition of examples of design excellence. Illustrating his lecture with images of a wide variety of bridges spanning the last two thousand years - including Pont du Gard, Pont Schuman, Covent Garden's Bridge of Aspiration, and the Gelsenkirchen suspension bridge - Mr Firth held the view that while engineers are accustomed to designing for safety, strength, stability and durability (among other considerations), many of them fail to include elegance and long-lasting aesthetic appeal into the mix. In a world that has become increasingly tolerant of mediocrity, he asked whether the construction industry has the appropriate procurement processes in place to deliver elegant bridges and provide the right training to enable engineers to effectively tackle the elegance question. He referred to the guiding themes established by legendary Roman architect and engineer, Vitruvius, for building construction: firmitas (strength), utilitas (functionality), and venustas (beauty). Echoing American scientist and political theorist Benjamin Franklin's remarks, Mr Firth stated that "bitterness of quality remains long after the sweetness of low price is forgotten". 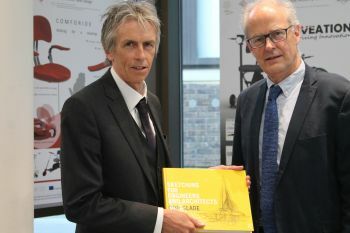 In appreciation of his lecture, Mr Firth was presented with a gift of City alumnus Ron Slade's Sketching for Engineers and Architects, by MCSE Dean, Professor Roger Crouch. 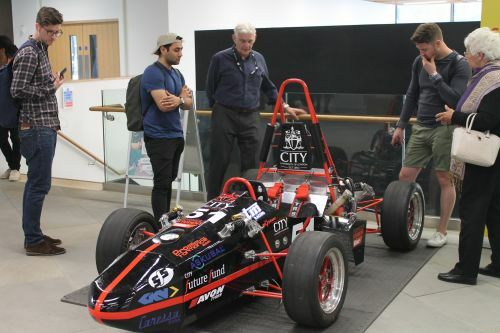 Displayed in the foyer of the Northampton Square University Building during the CDW event were: The Formula Student racing car designed by Electrical & Electronic Engineering and Mechanical & Aeronautical Engineering students; a Tennis Ball Server Machine (winner of the Dragon's Den Student Design, Manufacture and Test competition held in April 2018); and one of the oil injected twin screw compressors designed in City's Compressor Technology Centre (developed in collaboration with Kirloskar Pneumatic Company Limited) whose uses include refrigeration.